Sudden Wealth - What Should You Do If You Strike It Rich? If a few million dollars—or more—fell into your lap tomorrow, what would you do? But while sudden wealth may sound like a dream come true, it’s often accompanied by serious challenges resulting from the “sudden” aspect of that money. With sudden wealth, everything about being rich—the good and the bad—happens all at once. In contrast, most people who build wealth slowly are able to address issues and concerns incrementally over time. The result: Sudden wealth can be an emotionally charged and overwhelming experience. Sometimes there are emotional challenges because of the source of the money—a relative who died, for example. Feelings of panic or guilt can go hand in hand with the feelings of excitement. All those swirling emotions can cause recipients of sudden wealth to make bad—sometimes exceptionally bad—decisions about the money and about their lives. To be sure, getting rich quickly can solve many financial problems. At the same time, getting rich quickly can create big problems in your relationships with other people—including the people in your life you care about most. Some examples: Family and friends may knock on your door looking for funds from someone they now see as a financial “white knight.” A sibling might be looking for an investor in her new business, or a distant relative might ask for help paying medical bills. A friend might hit you up for a loan. Your marriage can be impacted, too. Shared decisions about how to spend, save and invest the new wealth can create friction. Before you got rich, your money was used largely to pay the bills. Now, with a lot more money, the myriad possibilities can create a wedge between spouses. Sudden wealth can also impact new relationships. Are new friends—and, especially, new potential romantic partners—interested in you, or your money? 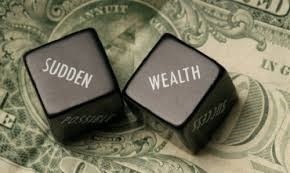 People who experience sudden wealth can also fall into several traps that can quickly erode or eliminate those assets. These wealth destroyers can impact anyone, of course, but we see them hit the suddenly wealthy especially often. Giving away too much money. If you give too much of your wealth away, you can end up in your own precarious financial position faster than you might imagine. Even loaning money can prove problematic and occasionally disastrous. Extravagant spending. There is nothing wrong with treating yourself well and enjoying a good life. But if the money needs to last a long time, excessive spending can jeopardize your financial future. The key is to identify the necessities, the “nice to haves” and the “not that importants” and balance them. Poor investing and planning. If you receive a windfall, there may be a lot of professionals seeking to help you manage your money and address your planning needs. There is a high probability that many of these professionals are going to be “Pretenders” who aim to do a good job but are simply not talented enough to help you. Lawsuits. Your sudden wealth can make you a target for unscrupulous litigants. One way to address this possibility is by safeguarding your assets. By working with a wealth manager who is well-versed in asset protection planning, you can potentially insulate yourself from prospective deceitful and ruthless litigants—legally. If you or a loved one is fortunate enough to become suddenly wealthy, here’s a process we recommend that can help you or the other person get prepared and set up for success. Assess your situation. You need a solid understanding of how much money there really is, and what you need and want to do with it. Often that requires slowing down and working through some of the emotions that accompany sudden wealth in order to think rationally about the windfall and its impact. A wish list, a balance sheet and a cash flow statement can all play a part in evaluating where you are and what you are considering. Rely on consummate professionals. You want to work with true experts—recognized authorities who understand the difficulties you face due to becoming suddenly wealthy, and who are able to help you chart a financial course that matches your needs and wants. Consummate professionals can also act as a sounding board when it comes to most aspects of dealing with your newfound wealth. Their extensive experience, expertise and ability to see your situation rationally rather than emotionally can be useful in helping you think through different matters and plans. Make reasoned decisions. To make a windfall work best for you, you need to make intelligent and informed decisions, such as avoiding impulse buying and suffering buyer’s regret. Moreover, it is crucial to always recognize that you are in charge and to take responsibility. ACKNOWLEDGMENT: This article was published by the VFO Inner Circle, a global financial concierge group working with affluent individuals and families and is distributed with its permission. Copyright 2019 by AES Nation, LLC. VFO Inner Circle and AES Nation are not affiliated with LPL Financial. This report is intended to be used for educational purposes only and does not constitute a solicitation to purchase any security or advisory services. Past performance is no guarantee of future results. An investment in any security involves significant risks and any investment may lose value. Refer to all risk disclosures related to each security product carefully before investing. Securities offered through LPL Financial. Danielson Financial Group is a registered representative of LPL Financial. Danielson Financial Group and LPL Financial are not affiliated with AES Nation, LLC.